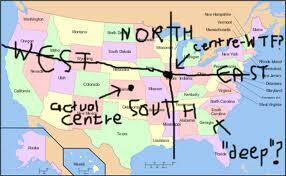 Where is the “Deep South”? I found myself wondering this. Others have also wondered, as I found on Google images. Most definitions include the states of Alabama, Georgia, Louisiana, Mississippi, and South Carolina. The seven states that seceded from the United States before the firing on Fort Sumter and the start of the American Civil War, and originally formed the Confederate States of America. In order of secession they are: South Carolina, Mississippi, Florida, Alabama, Georgia, Louisiana, and Texas. Due to the migration patterns of the last half-century, some areas of Florida and Texas are often no longer included under the term (see South Florida). 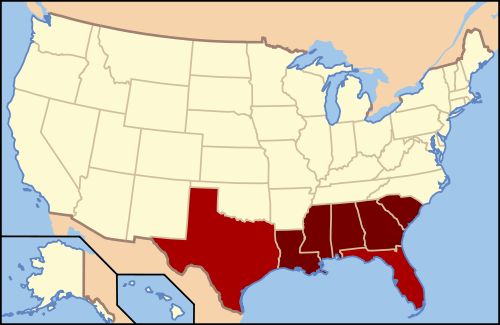 However, there are certain parts of these states, such as East Texas, the Florida Panhandle, the First Coast, North Central Florida, and Central Florida that retain cultural characteristics of the Deep South. The states in dark red compose the Deep South today. Adjoining areas of East Texas, North Florida, Florida Panhandle and north-central Florida are also considered part of this subregion. Historically, these seven states formed the original Confederate States of America.